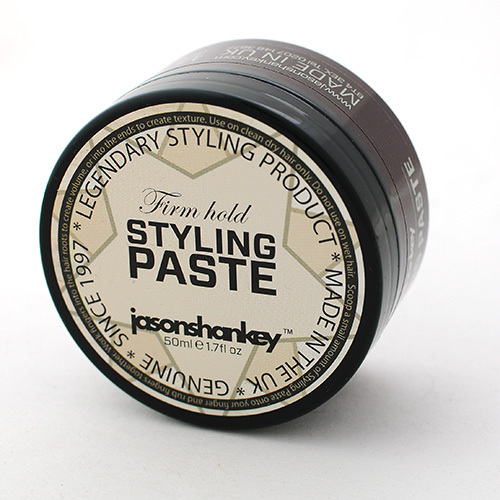 A multi-purpose, texturising paste for versatile styling. Tested on Barbers, not animals. Get Thicker Looking Hair that Looks Great All Day! Our best seller! The all-new Expert Styling Paste has been specially formulated to absorb excess oil from your scalp and give your hair a smooth matt style, giving the appearance of thicker, fuller hair. If you’re looking for a way to make your hair look thicker and healthier – and keep it perfectly styled too – Expert Styling Paste is the answer! Like the rest of the Expert Range, this product is the result of Jason Shankey’s years of experience in the male grooming industry … and has been specially formulated to deliver you a range of great benefits. Its long-lasting, medium-firm hold will keep your hair looking great throughout the day, and the special formula means you won’t end up with more paste on your hands than in your hair! And as the paste actually absorbs excess oil from your scalp, your hair will look thicker and feel as good as it looks! So you can relax knowing that if you are not 100% satisfied with the Jason Shankey Expert male grooming products purchased on this site, you can return them and get your money back.